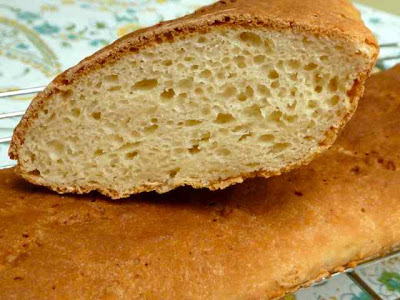 This French Bread is moist and tasty with a crisp crust. It is best eaten when freshly baked. You can keep it a few days at room temperature or in the fridge and toast the slices; or you can freeze the freshly baked loaf. To use the frozen loaf warm up the whole loaf in the oven or thaw it out to make garlic bread and then heat it up in the oven. 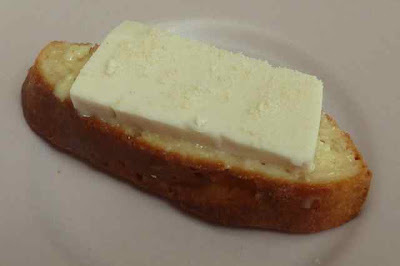 If you slice it and then freeze it you can toast a piece whenever you like. This recipe is fairly easy to make. You can have a loaf or two of bread in about an hour and a half. For me cakes and other sweet things are easy to convert to GF, but bread-like recipes I have found to be more difficult. It has taken me many tries to make gf pretzels from a regular recipe and I am still trying to perfect gf cinnamon rolls. I did not have the time to perfect a French bread recipe in time for the French Tea so I used one that was already gluten free. I found the recipe by GlutenFreeGirl on Food.com. I made one loaf as is and then I tweaked it a bit to my taste by adjusting the flours and liquids. I am posting my ‘tweaked’ recipe. 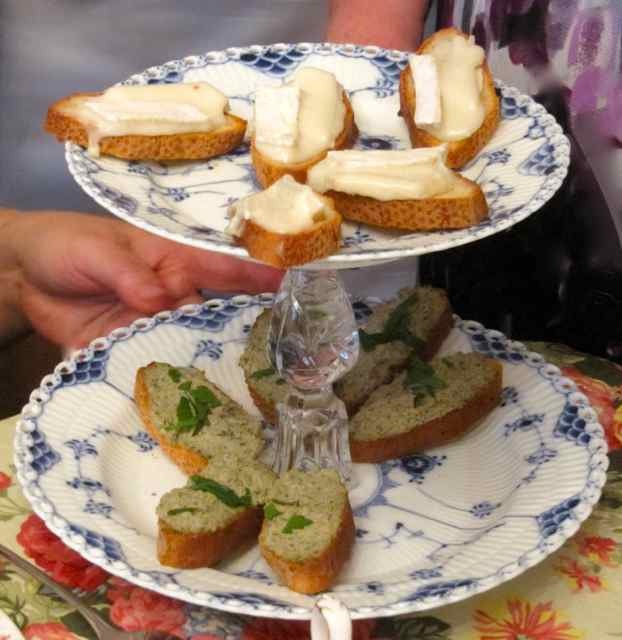 I served Brie, Veggie ‘Brie’ and Vegetarian Pate on the toasted French bread at my tea party. The pate recipe is one that I have been using for many years. I do not know the original source. The recipes and instructions for these will be on the end of this post. 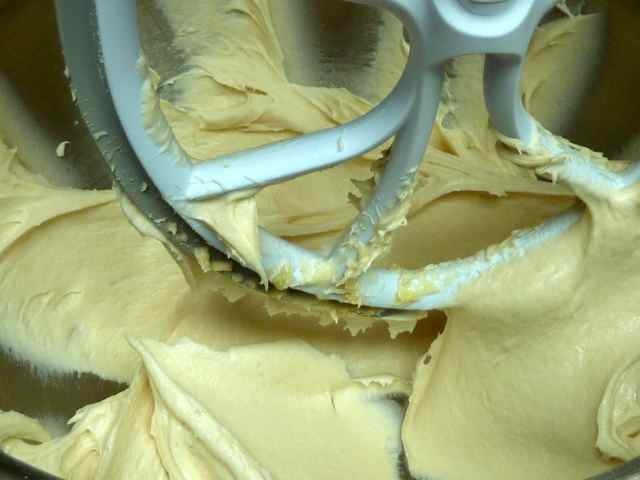 optional Melted Butter or Margarine or Oil for brushing the top. Gather all the needed ingredients. Ingredients should get to room temperature before you begin. You will need a French Bread pan. Create a proofing box (see instructions in my Challah Bread Recipe) by heating a few cups of water in a heat proof bowl or cup in the microwave oven for ten minutes or longer as you make the dough. Leave the cup/bowl of water in the microwave with your dough as it rises. Heat and moisture allow bread to rise well. In a bowl add 1 1/4 cups of warm water (110 degrees) and the honey and/or sugar and mix well. Sprinkle the yeast on the top and stir it in. Set aside. 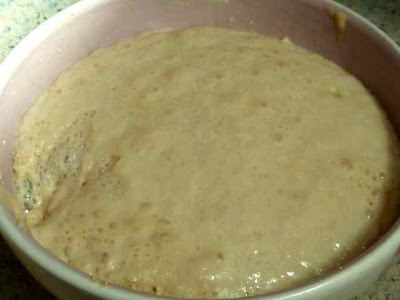 Yeast after it has dissolved in the water and foamed up. In the bowl of an electric stand mixer add the flours, salt and xanthan gum and mix together on low speed until well blended. When the yeast foams add it to the flour mixture in the bowl and mix together on low speed. Add the eggs, oil and vanilla and mix on low for about 30 seconds and then beat on high for 3 minutes. The dough will be more like a cake batter, quite sticky and pale. Spoon out the dough onto the bread pan dividing the dough into two loaves as evenly as you can. Wet your hands and smooth out the loaves. Form them as high as you can, they will flatten and spread out as they rise and bake. Make slits on the top of the loaves using a sharp serrated knife. If brushing the top with butter or oil do so now before the loaves rise. Dough spooned out onto the baking sheet with slits cut into the top. Arrange the racks in the oven so that the bread will be in the center of the oven and the lower rack will have room to fit a pan with water. Preheat the oven to 400 degrees. Place a baking pan filled with water in the bottom shelf of the oven. The bread will bake better with moisture in the oven. Place the pan into your proofing box aka microwave oven...do NOT turn on the microwave oven...close the door and let the loaves rise for 20-25 minutes until doubled in bulk. Bake the risen loaves in the oven for 30-40 minutes until nicely browned and the internal temperature is 210 degrees. Baked loaf of French Bread. 15 oz. Fresh Green Beans - steamed. You can also use canned (drained) or frozen ones (steamed). 5 large Eggs - Hard Boiled and shelled. Sauté the chopped onions in the oil until brown. In a food processor add nuts and pulse until fine. Add the green beans and 3 of the hard boiled eggs and run the processor until combined and somewhat smooth and transfer to a bowl. Hand chop the remaining 2 eggs and then mix by hand into the processed mixture. For a Vegan Veggie Pate I would recommend the recipe on the Veg Kitchen Blog. I have made this and it is very good. I used a Goat Brie with vegetarian enzymes on the baguette slices for the French Tea Party. For the Dairy Free version I spread Earth Balance Buttery Spread on each slice of bread and then topped it with a slice of Follow Your Heart Mozzarella with some Go Veggie Parmesan sprinkled on top to punch it up. Dairy Free 'Brie' with dairy free parmesan on top. I sliced the French Bread and toasted the slices for a few minutes in the oven before topping them with the cheese and pate. Toasted slices of French Bread on a baking sheet. Veggie Pate on left and Brie on right side of tray. 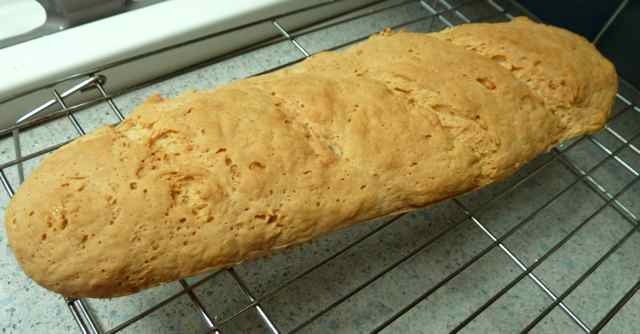 GLUTEN FREE FRENCH BREAD 2 loaves Ingredients 2 cups Sweet Rice Flour 3/4 cups Tapioca Flour 1/4 cup Chickpea Flour 1 Tbs. Xanthan Gum 1 1/2 tsp. Sea Salt 1 Tbs. Sugar - I used evaporated cane juice crystals 1 Tbs. Honey (or another Tbs. of sugar) 2 Tbs. Yeast 1 1/4 cups Warm Water 2 Tbs. Olive Oil or melted Butter or Margarine (not hydrogenated) 1/4 tsp. Vanilla Extract 2 large Eggs optional Melted Butter or Margarine or Oil for brushing the top. Directions Gather all the needed ingredients. Ingredients should get to room temperature before you begin. You will need a French Bread pan. Create a proofing box (see instructions in my Challah Bread Recipe) by heating a few cups of water in a heat proof bowl or cup in the microwave oven for ten minutes or longer as you make the dough. Leave the cup/bowl of water in the microwave with your dough as it rises. Heat and moisture allow bread to rise well. In a bowl add 1 1/4 cups of warm water (110 degrees) and the honey and/or sugar and mix well. Sprinkle the yeast on the top and stir it in. Set aside. In the bowl of an electric stand mixer add the flours, salt and xanthan gum and mix together on low speed until well blended. When the yeast foams add it to the flour mixture in the bowl and mix together on low speed. Add the eggs, oil and vanilla and mix on low for about 30 seconds and then beat on high for 3 minutes. The dough will be more like a cake batter, quite sticky and pale. Place the French Bread Pan on a baking sheet. Spray the pan with cooking spray or wipe oil on it and sprinkle with cornmeal. (Just a note here from the ‘don’t do what I did’ category: The French Bread Pan has holes in it. This helps to crisp the bottom of the loaf. The corn meal you sprinkle on the pan will fall out the holes and onto the bottom of the oven. I also found strange little brown dots of baked dough all over the bottom of the oven. Use the baking sheet under the bread pan to save you from cleaning the oven after you bake. My first loaf stuck to the pan with just the cornmeal so for the next time I used oil and then cornmeal on the pan and this worked very well.) 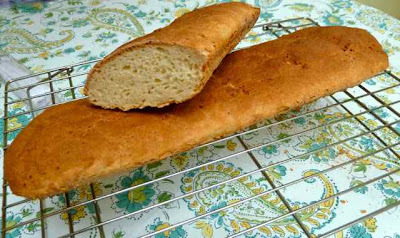 Spoon out the dough onto the bread pan dividing the dough into two loaves as evenly as you can. Wet your hands and smooth out the loaves. Form them as high as you can, they will flatten and spread out as they rise and bake. Make slits on the top of the loaves using a sharp serrated knife. If brushing the top with butter or oil do so now before the loaves rise. Arrange the racks in the oven so that the bread will be in the center of the oven and the lower rack will have room to fit a pan with water. Preheat the oven to 400 degrees. Place a baking pan filled with water in the bottom shelf of the oven. The bread will bake better with moisture in the oven. Place the pan into your proofing box aka microwave oven...do NOT turn on the microwave oven...close the door and let the loaves rise for 20-25 minutes until doubled in bulk. Bake the risen loaves in the oven for 30-40 minutes until nicely browned and the internal temperature is 210 degrees. GLUTEN FREE VEGETARIAN PATE aka VEGGIE CHOPPED LIVER Ingredients 15 oz. Fresh Green Beans - steamed. You can also use canned (drained) or frozen ones (steamed). 1 Tbs. Olive Oil 2 Medium Onions - chopped 5 large Eggs - Hard Boiled and shelled. 2 oz. Walnuts - lightly toasted or raw to taste Sea Salt and Pepper (My secret ingredient is Low Sodium Vegit) Directions Sauté the chopped onions in the oil until brown. In a food processor add nuts and pulse until fine. Add the green beans and 3 of the hard boiled eggs and run the processor until combined and somewhat smooth and transfer to a bowl. Hand chop the remaining 2 eggs and then mix by hand into the processed mixture. Chill overnight and serve. For a Vegan Veggie Pate I would recommend the recipe on the Veg Kitchen Blog. I have made this and it is very good. 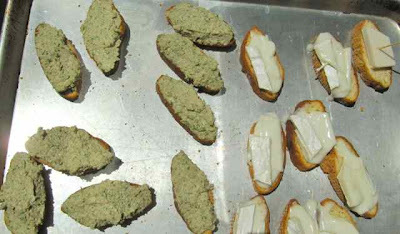 Brie and Dairy Free ‘Brie’ I used a Goat Brie with vegetarian enzymes on the baguette slices for the French Tea Party. For the Dairy Free version I spread Earth Balance Buttery Spread on each slice of bread and then topped it with a slice of Follow Your Heart Mozzarella with some Go Veggie Parmesan sprinkled on top to punch it up. I sliced the French Bread and toasted the slices for a few minutes in the oven before topping them with the cheese and pate.